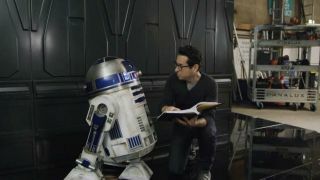 What does this mean for Star Wars 9? J.J. Abrams had better hope he’s made some backups. According to Daisy Ridley, the Star Wars 9 director (who, at the time, was one and done after Star Wars: The Force Awakens) actually wrote drafts for Star Wars: The Last Jedi and Star Wars 9. The problem? Rian Johnson wanted to do his own thing. Now, we’re kinda left with a big problem heading into the trilogy’s final chapter. As revealed by Ridley in an interview with French publication Le Magazine GEEK (and translated by The Playlist), things originally seemed far more straightforward for movie plans in a galaxy far, far away, “J.J. wrote Episode 7, he also wrote drafts for [The Last Jedi] and [Star Wars] 9.” Nice and simple. So far. Ok, that throws up a lot of questions that I’d love to have answered. What storylines were decided in advance? Johnson sure had a lot of fun in chucking away the Snoke build, for example, and would Abrams really have killed off Luke Skywalker? We’ll probably never know but, with Colin Trevorrow out and Abrams in for Star Wars 9, one thing is for certain: The Last Jedi is looking more and more like the muddled middle child. Will Abrams be tempted to go back to his old drafts and keep some of the broader strokes? It’s possible, but it’ll just add to the confusion. We’ve now been left with the unique situation of a trilogy being helmed by one director, with an outlier sandwiched in the middle of it all. Star Wars 9 may yet stick the landing after The Last Jedi left everything up in the air but, with J.J.’s original plans gone the way of the space-dodo, it’ll be very interesting to see whether Abrams decides to pick up the pieces with his old stuff, or forge forward using Johnson’s story. Either way, it’s not ideal for Lucasfilm and Disney. We could end up getting the conclusion that no one particularly wants, all because of a lack of forward-planning. Is your brain scrambled? Let’s try dealing in nice, comforting facts. The best Star Wars facts, to be precise.